The attractive town of Penicuik was an early centre for paper-making, with several large mills built in the eighteenth century to take advantage of the power of the River Esk. The town's history as a garrison dates back to the Napoleonic Wars when a POW camp was opened on the site of what is now Glencorse Barracks. As the number of prisoners increased two of the paper mills were pressed into service to provide emergency accommodation for the POWs. 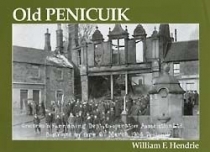 The wide-ranging selection of pictures in this book covers all aspects of Penicuik's past - industrial and social - and also includes views of Milton Bridge, Auchendinny, Howgate, Glencorse, Silverburn and Leadburn.